October is the end of the courses season. Subscribe to our newsletter to receive updates. "Just a quick line to say "thank you" for a fabulous day today! 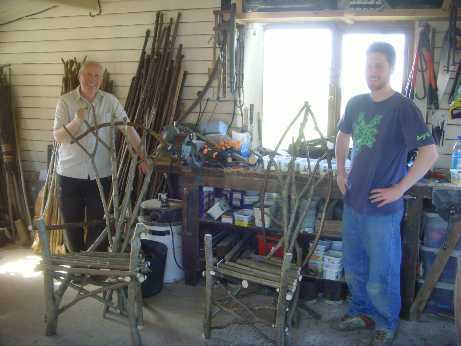 "Thank you for the time you spent with my father and I, instructing and assisting us to construct rustic chairs - we both thoroughly enjoyed the occasion" - Henrik P.
"We pick out different curves, kinks and forks to bring together so you can create a unique rustic chair for your house or garden." 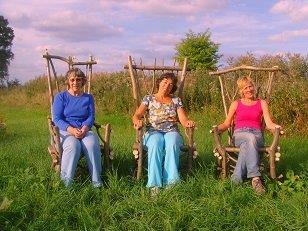 You can expect to make in a day a large comfortable armchair (not so large it won't fit in your car!). See pictures to the right for a typical example. 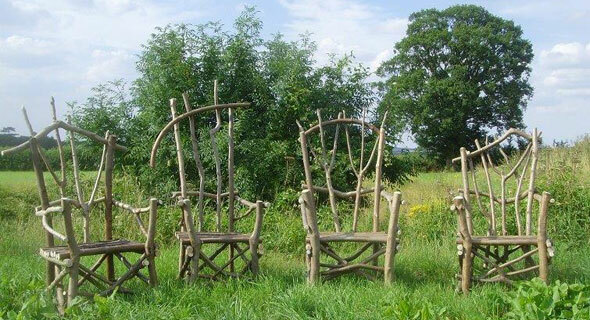 Storytelling thrones can be constructed also in a day by one person, but there is a supplement of £25.00 to cover the pre-steamed and bent arms and gothic back. Every year we 'coppice' or harvest a huge amount of hazel from the reserve we manage and we always put to one side all the interesting shapes that occur in nature especially for our rustic furniture making. Having a large stock of this 'quirky' hazel, not just straight characterless poles, is one of the key elements to the aesthetic appeal/success of this style. 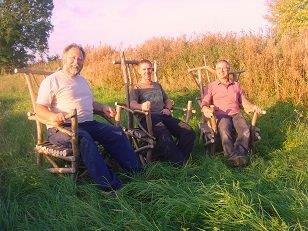 Of all the hundreds of people who have made a chair with us - no one has failed to take their own chair home. 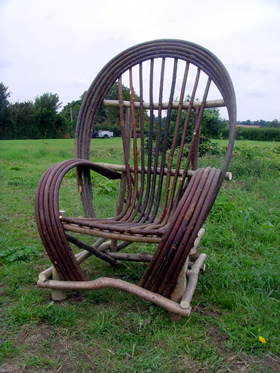 If you can peel an apple, you can make a chair. However if for some reason you would prefer a 'one-to-one' day and receive a higher level of tuition, by all means contact me to arrange a date. A one to one is also appropriate for anyone wishing to steam bend their own components and have more time for 'embellishments'! We provide a print out detailing full after care instructions. Another key to the success of this course has been the use of modern compact cordless tools, which we provide, that are very easy and efficient to use, with modern exterior screws. 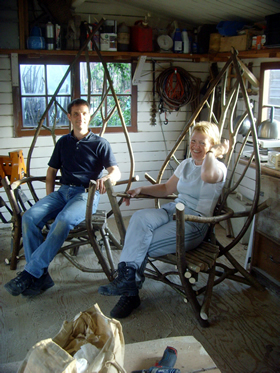 Absolute beginners are very often surprised at how easy it is with our guidance, and gain tremendous satisfaction in seeing their own unique chair/ throne/ bench develop and becoming more rigid as pieces are tailored and fitted. Please refer to the right side column for dates, note that if there are two of you coming together we can probably accommodate you on alternative dates, preferably Tuesday/ Wednesday / Thursday or some Saturdays may be available - but not many, due to attending shows etc. 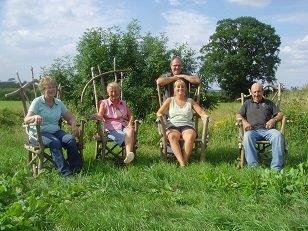 "My chair has pride of place in the garden and everyone seems to want to use it. Thank you again for one of the great days of my life." David Teather. 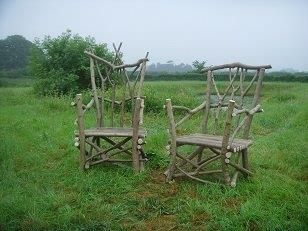 "Hi Andy, we had a great day yesterday and are chuffed to bits with our chairs, thank you." Tania and Simon.